Despite it being the middle of August, some pests are not showing signs of wrapping this season up. 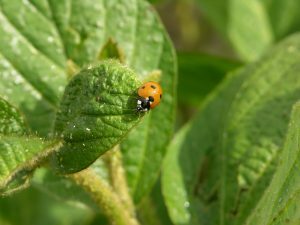 Bean leaf beetle are a particular concern in food grade IP and seed soybeans and edible beans across Ontario. 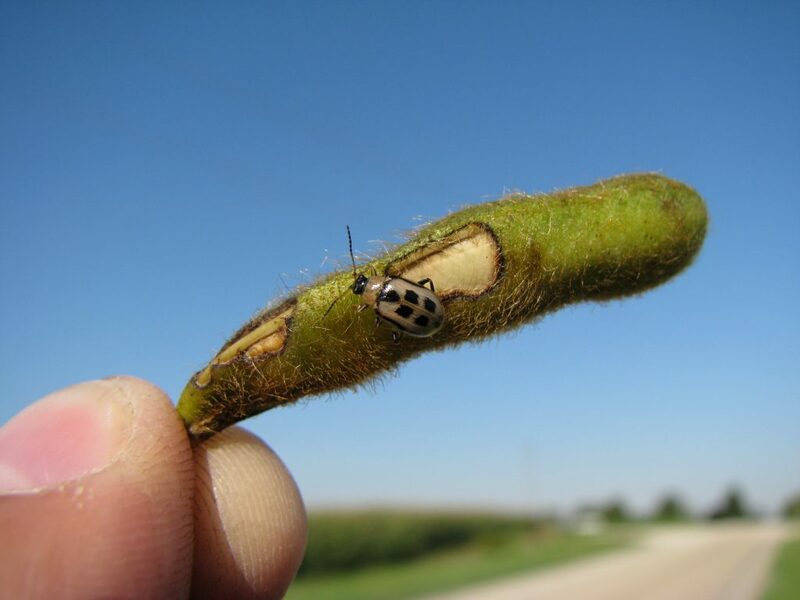 As are pod piercing pests like stink bugs and tarnished plant bugs. Soybean aphids are also increasing in numbers, particularly in fields in Eastern Ontario. So scouting is not over yet , I am afraid. Bean leaf beetle can feed on the leaves, although the defoliation they do rarely reach threshold levels to impact yield this time of year. It is their pod feeding that can be a concern, especially in the later R stages of pods. Pod feeding can open the pods up to the development of pod diseases, impacting quality. Bean leaf beetle can also clip pods off of the plants which can have a direct impact to yield. For R4–R6 Stage of IP, Food Grade and Seed Soybean and Dry Bean Fields – Assess 20 plants in five areas of the field. Avoid the field edge. Determine the percent defoliation and the number of pods damaged or clipped off and make note of the presence of adults. 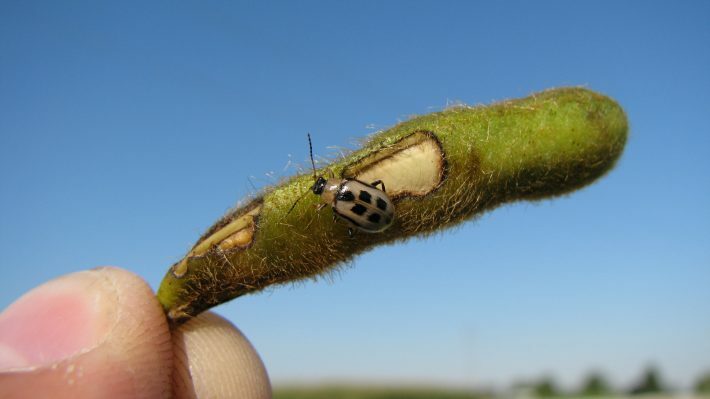 For Soybeans: If 10% of the pods on the plants have feeding injury AND the beetles are still active in the field, a spray is warranted. If pods are being clipped and found on the ground, an application is warranted if beetles are still active in the field. Consider days to harvest intervals before making a spray decision. For Dry Beans: With higher value and stringent quality standards in dry edible beans, if 5%–8% of the pods inspected have feeding scars, control may be necessary. If pods are being clipped and found on the ground, an application is also warranted. 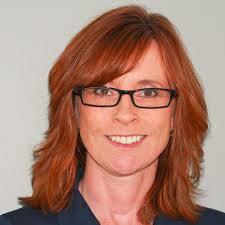 Ensure that adults are still presently active in the field before a spray is applied. Consider days to harvest intervals before making a spray decision. 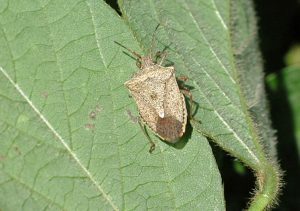 Stink bugs and tarnished plant bugs feed directly on pods and seeds. Both the adults and nymphs have piercing and sucking mouthparts for removing plant fluids. They inject digestive enzymes into the seeds, causing the seed to dimple or shrivel, resulting in picks. The feeding wound provides an avenue for diseases to gain entry into the pod. Seed quality is reduced. Indirect effects can include delayed maturity — green bean syndrome —of injured plants, though stink bugs are not the only cause for green bean syndrome. per sweep by dividing the total count by 100. 0.4 adults or nymphs per sweep is found during the R4 to early R6 stages of soybeans. or adults) per sweep is found during the pod stages. Soybean aphids are increasing in numbers per plant, particularly in Eastern Ontario. Some fields in southern Ontario have experienced a significant drop in aphid numbers, likely in part due to natural enemies. Fields that have aphids present should be scouted every 7–10 days until the crop is well into the R6 stage of soybeans. Scout fields more frequently (every 3–4 days) as aphid populations approach the threshold. Look at 20–30 random plants across the field. Avoid field edges. Estimate the number of aphids per plant in that field and the abundance of natural enemies present. A minimum of two field visits is required to confirm that aphid populations are increasing. The threshold for soybean aphids is 250 aphids per plant and actively increasing on 80% of the plants from the R1 up to and including the R5 stage of soybeans. More aphids per plant are needed once soybeans are in the R6 stage. Beyond the early R6 stage, economic return from any insecticide application is not likely and pre-harvest intervals have been reached. Natural enemies play a big role in taking soybean aphids down below threshold, especially when aphid pops are just hovering below or above the threshold. Making observations of natural enemy presence can help you determine if a spray will be necessary. Use the free Aphid Advisor app, plugging in the number of aphids you see, as well as natural enemies. The app will calculate the number of aphids that will be fed on based on the natural enemy and aphid population and determine if a spray is necessary. For more information on any of these pests and registered products, please refer to the Agronomy Guide for Field Crops. the Field Crop Protection Guide and the Pest Manager App.